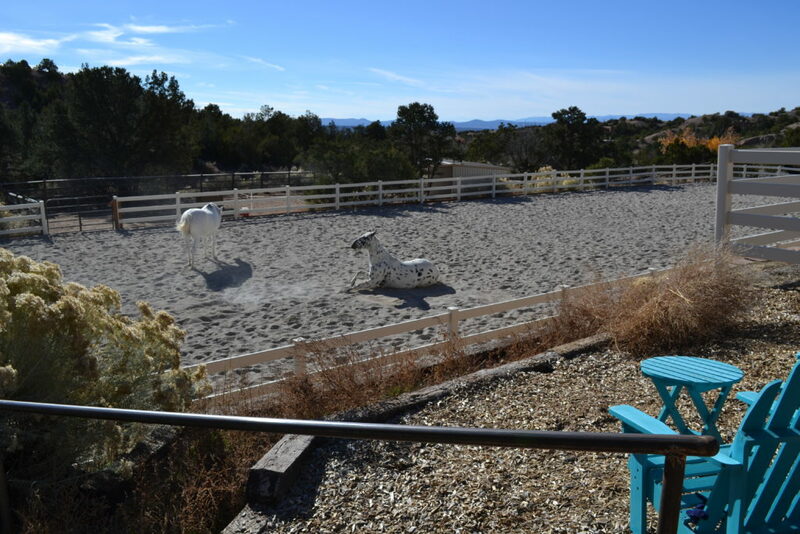 The ancient wisdom of horses, yoga, and meditation come together at the beautiful Thunderbird Ridge to offer a unique variety of transformational sessions and retreats. The only equipment you’ll need is an ounce of curiosity and a willingness to explore an immersive, life-changing experience. The beautiful herd at Thunderbird Ridge captured in action by Photographer Tony Stromberg. The wellness retreat is more important than ever as life’s challenges intensify in the digital age. The relentless daily stress of being so “plugged in” makes it hard to feel truly connected with yourself or others on any meaningful level. The equine experience does not involve riding horses, and it isn’t therapy. It is known as Equine Integrated Learning. But it can be very relaxing and can trigger a domino effect of insight, and healing awareness that stays with you long after you leave the ranch. The time needed for an experience with EQUUS can range from one hour up to three days. No previous experience with horses, meditation, or yoga is required. Leave your preconceptions at the gate, and you’ll enjoy a fun, effective and greatly rewarding exploration. I can say that because I have experienced it, and I highly recommend it. Cimarron and Blue enjoying the paddock. Views to the west of the Jemez Mountains. 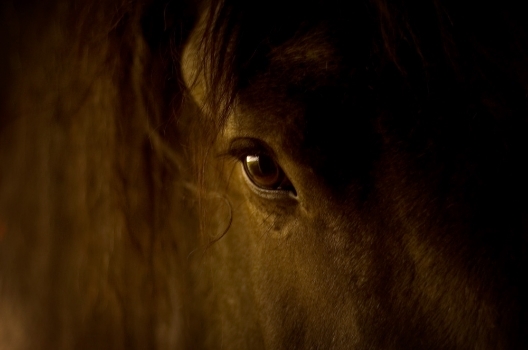 The Equus Experience® is a title that encompasses a wide array of processes, which defy a hasty, simplistic explanation. No two sessions will be the same, just as no two people or no two horses are the same. I first came to EQUUS with no idea of what to expect, but definitely a healthy dose of curiosity. With the daily stresses and challenges of running a business, needless to say, I was a bit tense and my mind was filled with distracting to-do lists that hadn’t included finding the time to hang with horses. Kelly explained that horses are equipped with hypersensitive inner antennae, making them extremely aware of the slightest shift of energy in their surroundings. They have an almost 360-degree field of perception and an ability to sense the subtlest of non-verbal cues from us. Most humans are inundated with constant mind chatter and distracting thoughts – worries that project us into the future, and daydreams that hold us lingering in the past. 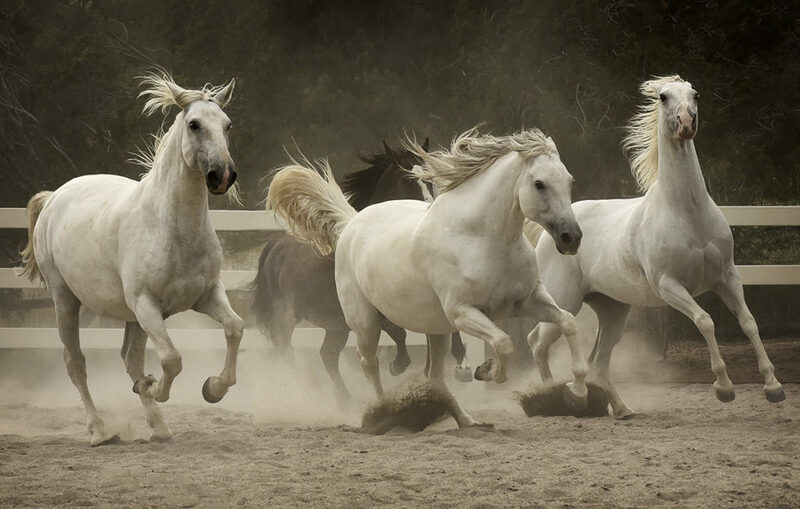 Horses live in the present moment at all times. While most of us are unaware of our body language, the slightest shift in our demeanor, or mood is noticed by these wonderful horses. Together with the expert guide, these horses offer amazingly accurate biofeedback to anyone entering their environment. What may take days to accomplish on a vacation, can be compressed into a few minutes with these wonderful beings. All our usual armor and pretenses are bypassed because it is what we may be unaware of in ourselves that is more noticeably present for the horses. We are seen on a very pure energetic level. Although, for most of us, that may be a little scary at first, it is extremely liberating and a huge relief to connect with such clarity and learn more about ourselves. As Kelly and I stood talking by the paddock, a beautiful white mare named Blue seemed to be showing an interest in me. When Kelly told me about Blue and her story, I felt a little exposed knowing I was being observed by this majestic beauty. I couldn’t help my mind’s inner chatter, wanting to be in control, to know what she was thinking, and what it was about me that intrigued her. Luckily, she wasn’t hearing my mind, she noticed my energy and I began to relax and just let my curiosity open the space for our meeting and my mind chatter was swept out of the way. With no distractions, things just got easier and more fascinating. The sense of being present for a half hour with Blue was more refreshing and rejuvenating for me than an entire day at the spa. Blue and me having a heart to heart. Dante eavesdropping. Dante was once with Cavalia (the equestrian performing arts troupe). Through the session I became aware of how Blue’s history, her confidence, strength and courage was something I could learn a great deal from. It was a wonderfully rewarding journey that stayed with me long after the session ended. The equine experience will vary for everyone, and may involve one horse, or more. 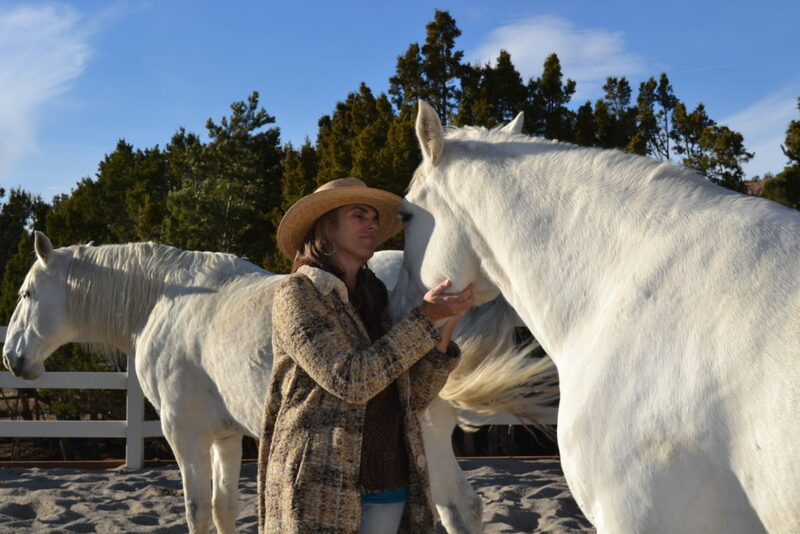 To connect with the ancient wisdom and genuine biofeedback of this special horse herd is to touch on your own true, authentic nature and gain insight and wisdom that is inarguably valuable. Let’s face it, it is validating when a wise horse lets you know you are actually a pretty cool person, or that you may have special gifts of your own to offer the world that may have been hidden from yourself and others. I know that my two sessions have barely touched the surface of insight and learning available to me. 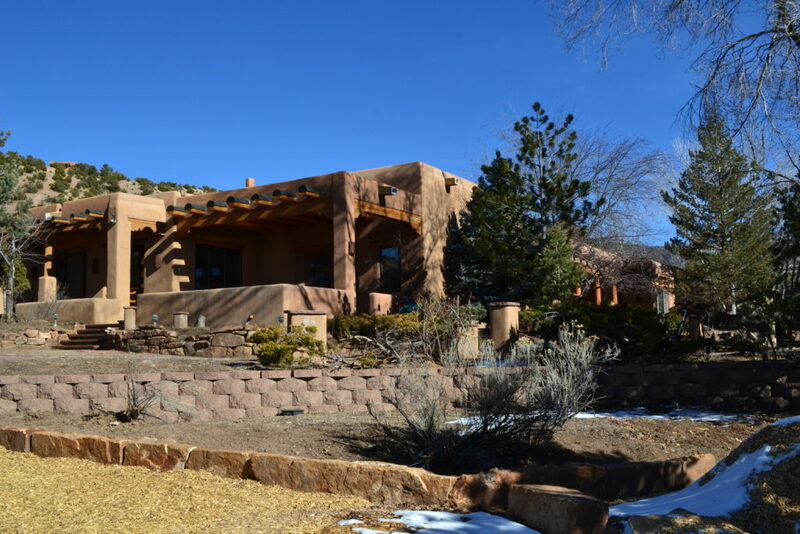 Thunderbird Ridge is nestled in the foothills of the Sangre de Cristo Mountains. 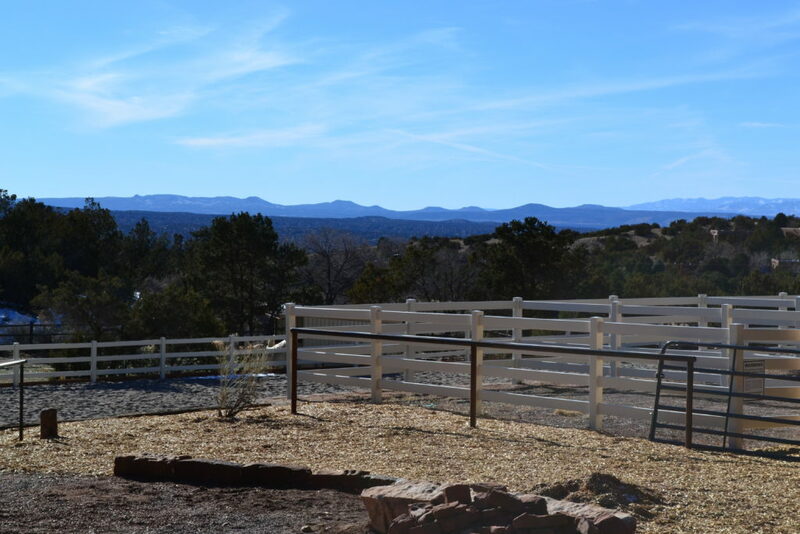 The property offers stunning vistas and rambling trails through 11 acres. The beautiful hacienda-style home has overnight accommodations for individual guests during private multi-day intensives, and many indoor and outdoor contemplation and gathering areas. From this spot you’ll have sunset views, and excellent star gazing opportunities – away from city lights. Guests have the option of including yoga and meditation in their equine experience to varying degrees, or focusing entirely on the yoga and meditation aspect. Whether you’re a seasoned yoga practitioner, or meditator, the experience of meditating with horses definitely expedites and intensifies the “mindful” state. The house at Thunderbird Ridge with beautiful views and spacious rooms, and quiet nooks, and gardens for gathering, meditating, and yoga. The Equus Experience® has helped me find a greater sense of space between the tightly packed molecules of stress that build up through owning my own business, and being so constantly “plugged in”, not to mention the arduousness of my body’s aging process. Apologies for the TMI about me, but there you go. As the New Year approaches, and resolutions come to the fore, it is a great time to set an intention and head for these rolling Santa Fe hills for an authentic, immersive, life-changing experience. There are a variety of programs available, including special youth programs, business group or individual leadership skills, self-mastery and life skills programs. Session pricing starts around $150 + tax per person and range from one hour to multi-day retreats. Kelly and Scott will also customize to suit your intentions and group size. For more information or to book your session / retreat, contact Kelly Wendorf or Scott Strachan at (505)570-9908, or email: kelly@equussantafe.com. To subscribe to my monthly articles, please click here. Thank you!